Your Cooling System's Best Friend! Radiant Barrier Foil Attic Insulation can be your air conditioner's best friend once summertime rolls around! Of course, it is also a huge help in the winter as well. Our clients call this "A Great Find by the Doctor!". Our foil insulation works year-round to lower your energy bills. Reflective type insulation packs a punch with high R-Value in a minimally-sized material, so it can be easily installed in tight places, such as your attic or crawlspace. It creates a fantastic thermal barrier of a 95% airtight R16 to R21 value! Many people do not realize that an attic is a home's lungs and not actually intended to be used as a storage space. The climate in your home is greatly affected by the attic's ability to breathe. Doctor Energy Smart® wants to open your home's airways to let those lungs breathe freely! Fortunately, due to the relatively thin profile of foil insulation, there will be considerably more space in your attic for air to flow freely without obstructions, preventing overheating in the summer, moisture buildup, and mold. When it comes to proper roof insulation, fiberglass stuffed up along the roofline, between the rafters, creates a suffocation effect in homes with finished attics. This creates a condition that blocks fresh soffit air from reaching the peak vents or gable vents. If you enter behind the little kneewall areas and turn around looking towards the peak of your roof, you will see a view of these blocked airways. Old-school construction has hampered our ability to live in a healthy, energy-efficient home. Doctor Energy Smart® will evaluate your home's ventilation and pull all of the old fiberglass out. After removing the old fiberglass, we then install a breathing, foil wrap R-16 material, that sort of turbo-charges proper air flow, which in turn creates a perfectly guided "chimney effect". This chimney effect is achieved when cooler soffit air flows in and pushes that hot, stuffy attic air out of your home through the uppermost roofline vents. 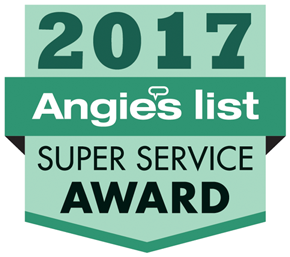 This has many benefits including prolonged roof life, huge comfort improvements and major energy savings. Don't wait until your guests and family fall victim to a stifling hot finished attic space! 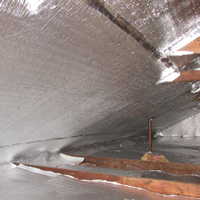 Any exposed flat surface like under a floor or in an attic is a great candidate for radiant foil insulation, due to its lower profile and lower cost. These sheets are also great on garage doors, concrete walls, barns, greenhouse floors, steel garages, and chicken coups. Not only does foil barrier insulation provide an R-16 value in a thin layer, it also creates a vapor barrier which every home needs. The foil insulation can be easily removed and replaced in case you ever need to get behind it for future repairs to your home or building. Many homeowners have a cement floor below their home, but unless a vapor barrier was installed during the initial construction,your home is likely to be unprotected from moisture rising up from the ground below.